I have found pure love, never thought I would say that about eye makeup. Jing Ai translates to Pure Love. The Eyepaint Mascara and Picasso Automatic Eye Pencil that I received for review really impressed me! I'm the girl that dabs on a little eye liner like a chore and skips mascara all together sometimes, and not because I have luscious long lashes - quite the opposite. So for me to say that I'm in love with an eye pencil and mascara is pretty amazing! To start with, I love the awesome, pure ingredients in all Jing Ai products. No parabens or petrochemicals. Rich with nutrients in certified organics oils. I can feel good about putting on makeup instead of dreading it. 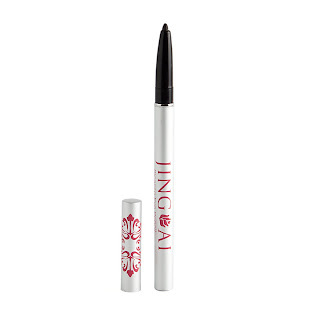 The Eyepaint Mascara has a nifty applicator that's unlike others I've used. It is soft and flexible and really helps define the lashes one by one. The organic mascara glides on effortlessly without clumps. It does really feel like paint! It does not smudge easily and I get my share of smudging with a 4 and 1 year old. I love that it has no 'mascara smell', you know what I'm talking about if you've used conventional mascara. It feels great knowing I am applying something that's actually beneficial to my eyelashes and will not ruin them. The Picasso Automatic Eye Pencil is equally amazing. Made with certified organic castor seed oil, champagne grape oil, coconut oil, sesame seed oil, wild rose flower oil, and beeswax - the application is so smooth and silky! 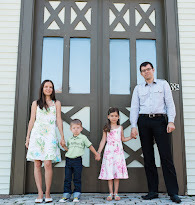 You can have a sharp defined line or give it a little wipe to soften the look. I love that I never have to sharpen it! I always avoided putting eye liner on the bottom, but now with something this sharp I no longer dread it, I have so much more control over it. Finally, eye makeup that's actually good for the eyes. Both the mascara and eye liner cost $22 each, a very reasonable price and honestly I wouldn't hesitate to pay this and buy it again when I run out because it is simply incredible. Jing Ai also makes lip gloss, automatic lip pencils, concealer, and bronzer. You can save a little by getting a set like the Eye Appeal, which includes the Eyepaint Mascara, Automatic Eye Pencil, and Concealer for $64, which would have been $69 if bought separately. Get 25% off on your first order and it's a sweet deal. See, I know you'll be hooked after trying it and will not want to buy anything else! 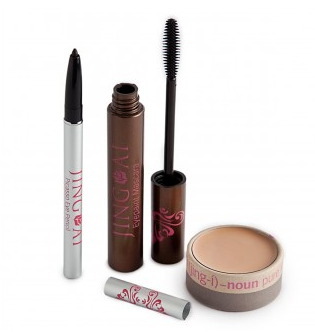 Win the Jing Ai Eyepaint Mascara and Picasso Automatic Eye Pencil as part of a package during the Mama's Got a New Look event which starts tomorrow, January 3rd! 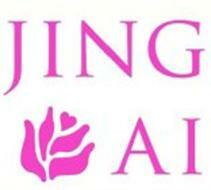 Shop Jing Ai - Get 25% off your first purchase when you sign up on the home page! I really want to try this brand, because I'm always interested in organic makeup and a friend of mine has their concealer and swears by it.If you look into ingredients of the major makeup companies all you see is chemicals which leads to a lot of not only skin problems and allergies but more deeper issues. i love love the ingredients! it's nice to know that it is a quality product as well- i'm always on the lookout for all-natural, organic body care & beauty products! thanks so much for the review! I love the all natural aspect, and the fact that you can wear this with a busy day of running your household and having the kiddos on the run...and it doesn't smudge, etc. That's wonderful!